After installing you will be asked to restart your Firefox browser. Once it has restarted, a window with three tabs will appear (if it doesn’t appear automatically, go to your Firefox toolbar, enter “tools” -> “extensions“, highlight Foxlingo, and click “preferences/options” – then the window with the three tabs will open). 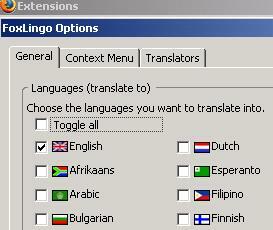 In the first tab you check which languages you would like to be able to translate to, in the second you check which languages you would like to be able to translate from, and in the third you check the translation services you want available (I recommend you check them all). Then you click OK and you will be given the option of contributing with a donation. Sometimes a site will appear in no language at all, but pure gibberish, then I click back to the original Chinese site and try another of the translation services. So far, I haven’t figured out what translation services work best for what kinds of Chinese websites (any ideas? ), but usually one or the other will work fine. Have fun in the Chinese cyberspace! What I especially like about this is that it allows you to compare the translations of the different services: WorldLingo, Google, AltaVista, and Bestiland. You can try each of them out on different kinds of sites. Reading Chinese for those not Chinese born is a difficult task. Ive seen some good Chinese students stay away from reading Chinese material because they figured its an impossible task.